Our sense of smell has an immediate and profound effect on the way we feel, due to the fact that our olfactory system is directly linked to our limbic system – the part of the brain that controls our moods and emotions. The limbic system also deals with our memory and houses a library of millions of different smells, many of which have strong childhood associations. This is why our response to a particular fragrance is intensely personal and rarely neutral as it may trigger very happy or unpleasant memories. When we are stuck indoors looking out at the gloomy weather, scents can provide us with a real pick-me-up, whether it’s a welcome bunch of the sweetest smelling narcissi reminding us that spring is just around the corner, or the smell of a comforting stew in the oven to warm us up on stormy nights. Here are five of our favourite uplifting mood-boosters that will all work their magic and help brighten up a dreary day, either on their own or together – blissful blends taken from Liz’s Aromatherapy ebook. Simply add to a hot bath before you step in and relax, enhance a room with their fragrance using an essential oil diffuser or burner, or add a drop or two into the kitchen sink to make the washing up a more joyful experience. Bergamot has a really beautiful aroma that can help lift our mood and focus the mind. Look for ‘bergapten-free’ on the label as this will have had certain compounds removed which may cause skin sensitivities. Mandarin essential oil is used by aromatherapists as a general tonic to help with stress and tension and has a delightfully cheering fragrance. You can also add it to massage blends to help boost circulation and reduce water retention. Lavender, with its comforting, soothing scent, is perhaps the most useful of all essential oils and definitely a must for the first-aid box. It has a gentle balancing action which is reputed to be able to either calm or stimulate depending on what is needed. Lavender oil has so many uses, as it also antiseptic, which makes it the perfect ingredient for a relaxing, cleansing facial steam. Lemon essential oil has a wonderfully zesty, sharp and refreshing aroma and is a traditional antiseptic and purifier. It is also useful for helping to clear blemished skin – add a few drops to a bowl of hot water and then put your face over it while you take slow deep breaths. Ylang ylang has a powerfully sweet, exotic and heady fragrance, similar to jasmine and is reputed to help calm the nervous system during times of depression, stress and overwork. Too much of this potent oil can sometimes cause headaches so be careful not to overdo it, but a few drops can really help to lift spirits. Let the blues float away by adding four drops of lemon and four drops ylang ylang to a warm bath just before you step in for the ideal, quick pick-me-up. Or if you need a little extra get up and go, try adding four drops of mandarin together with four drops of bergamot to the bathtub to feel wonderfully refreshed and rejuvenated. Add six drops of lemon, two drops of lavender and two drops of bergamot to a burner or diffuser to bring a fresh outdoor scent into your home and make spirits soar. More information on the best essential oils and how to use them, read Liz’s invaluable Aromatherapy ebook available via Amazon for just £1.99. 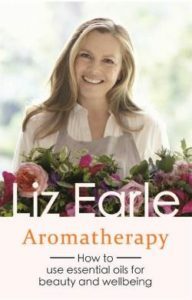 For another gorgeous use of essential oils, try Liz’s Homemade Herbal Steam Facial – a truly indulgent skin treat!